Ginette, Rita, Jacqueline and Jane try to find fulfillment and love in their lives. Rita has a fianc� whose family is obsessed with social distinction, Jane has a boy-friend in the army, but does not hesitate to enjoy herself with chance encounters, Ginette has a mysterious passion that keeps her away from her colleagues at nights. Jacqueline is lonely, but who is that mysterious bike-rider who is constantly following her ? Chabrol's masterstroke The 'overacting of the boss' mentioned in the previous comment is totally intentional! Chabrol is playing around with genres here, exaggerating for effect. He straddles the fence between comedy and tragedy for the entire film, veering this way and that whenever it serves his purpose: to paint an allegory of absurd modern existence through the soul of modern young females. The surreal modern music at the beginning clues you in, and the awesome final scene with the empty, tragic eyes of the girl finding her only happiness when a man asks her to dance brings it all together beautifully. Man! what a great film! I didn't want to leave the theater after watching it twice in a row, but I was too tired. 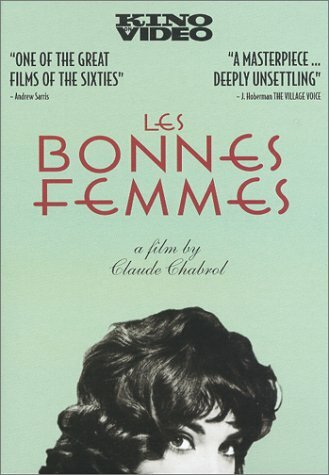 As disappointing as Chabrol's films have been to me over the years, this one was a jackhammer of a surprise. The Hitchcock elements are there but they don't dominate and straitjacket everything else. On a level with "Breathless," "Shoot the Piano Player," yet completely unlike either of them, this film defines the "New Wave" aesthetic, which to this day, some forty years later provides a standard for Tarantino types to strive for. Films like these can only be directed by masters who have the nerve and audacity to bend genres to their whim and speak their ultimate truth through the nature of the medium itself.